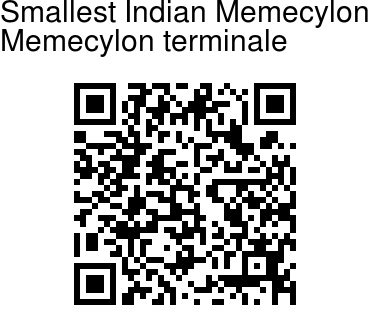 Smallest Indian Memecylon is a shrub about 4 m tall. Bark greyish, finely fissured. Branches dichotomously spreading; branchlets terete, glabrous. Leaves simple, opposite, decussate; petiole sessile or subsessile about 0.2 cm long), glabrous. Leaf-blade is 3.1-8.9 x 1.1-3.2 cm, ovate-lanceolate with tapering apex with obtuse tip, base rounded or subcordate, margin entire, coriaceous, glabrous; midrib slightly canaliculate. Inflorescence long peduncled (2 cm long) umbels, subterminal and axillary; flowers blue. Berry, 0.4-0.5 cm diameter, globose; seed 1. 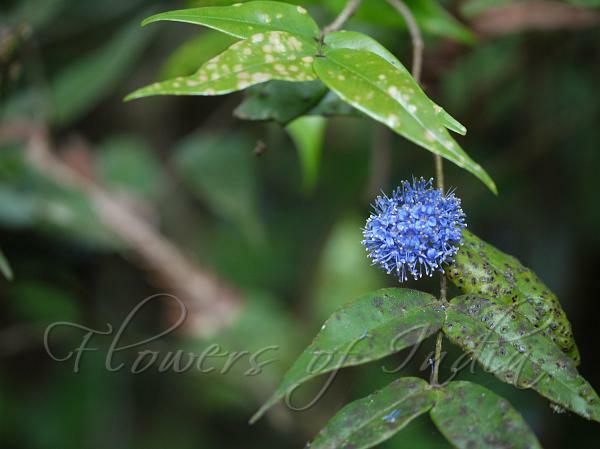 Smallest Indian Memecylon is occasionally found in the undergrowth in low-elevation wet evergreen forests, up to 700 m. It is endemic to the Western Ghats - mostly in Central Sahyadri and also recorded in Agasthyamalai.